How to apply for post of VRO? Are Diploma holders eligible for VRO post? Re: How to apply for post of VRO? written test-------general knowledge,aptitude further any changes it will reported. No written test will be held for this recruitment. The selection will be done with interviews. A panel under supervision of Joint Collector will take interview for VRO candidates and a panel under supervision of RDO will take interview for VRA candidates. The interviews will be held on 1:3 bases. Weightage marks will be added to those candidates, who already working in Revenue department on contract basis. ## Details such as eligibility, application procedure, Examination pattern etc will be provided after the release of respective notifications. ## The Government of Andhra Pradesh is gearing up for massive recruitments in various departments. The Government is gearing up to fill about 1,16,000 vacancies in Education, Police, Health, Excise, Revenue and Engineering Departments. ## The Govt. of Andhra Pradesh will fill up 6063 Village Revenur Assistants posts very soon. Details of posts, district wise vacancies, eligibility and selection procedure are also available for these posts. Scroll down below for latest update on 2nd August 2011. ## The Government of AP is likely to recruit 1564 Village Revenue Officers (VROs) in the pay scale of Rs. 7740 - 23040. Eligibility is pass in 10th Class. ## Selection will be through written examination which contains questions on general knowledge. ## Collegiate Education, Govt. of Andhra Pradesh has issued orders to renew the appointment / recruitment of Contract Lecturers in Degree Colleges in the state of Andhra Pradesh. ## The Depart of Higher Education will recruit 1766 posts on contract basis through this orders. ## New candidates will be recruited for the new vacancies. The Government of Andhra Pradesh has sanctioned 154 additions posts to supervise the activities of various post metric scholarships for BC students in the state. Vacancies are available in the levels of director, district and field workers. Details of new posts are Additional Director - 1 post; Joint Directors - 3 posts; Deputy Directors - 11 posts; Assistant BC Welfate Officers - 35 posts; Superintendents - 26 posts; Senior Assistants - 29 posts and Junior Assistants - 49 posts. Notification for the recruitment of these posts will be released soon. The Government of AP is likely to recruit 1564 Village Revenue Officers (VROs) in the pay scale of Rs. 7740 - 23040. Eligibility is pass in 10th Class. Selection will be through written examination which contains questions on general knowledge. VRO means Village Revenue Officers. Eligibility: Pass in 7th class. Male and female candidates eligible for VRA posts. If you failed in 7th class also can apply for VRA posts. Tahasildars will select the candidates based on the marks in marks in a qualifying examination. How to apply for vro ? The notifications regarding the post of Village revenue Officers in Andhra Pradesh have already being published. The candidates who are interested to apply for the above mentioned position of Village Revenue Officers (VRO) should go through a recruitment process. 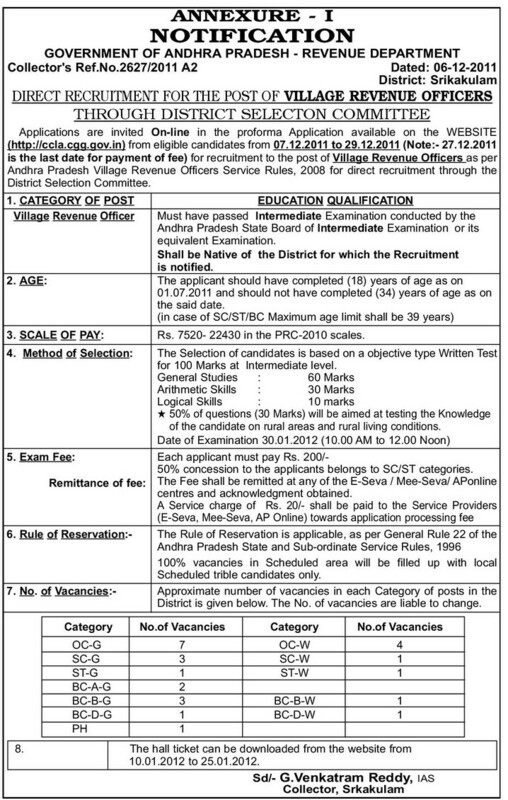 The basis of selection for the post of Village Revenue officer is through a written test. The Union Public service Commission administers this test. The minimum eligibility for attending the written examination for the above mentioned post is a 10th class. The candidates must have completed the 10th class from an institute which is reputed and recognized by the government. The number of vacancies for this post is around 1564. The pay scale for this post is Rs. 7740 – 23040. The mode of selection of the candidates is based on the written examination conducted by PSC. The candidates will be mainly tested in the areas of General knowledge. The test will be generally an objective type test. The candidates who get qualified in the written examination will be called for the personal interview. The final list of the candidates who are selected will be based on the performance in the interview. Different categories are VRO , VPS , VRA , their requirements are different but you can apply for them in a single mood. Eligibility criteria for VRA is 7th. Written test is based on Gk, Aptitude which can be prepared from R S Agarwal. how to apply for vro post and tell me where is the application forms in which link. About 1564 posts of Village Revenue Officers are to be recruited by the Andhra Pradesh government, for the different districts, for which the notification has already been released. The essential requirements for this post are that the candidate must be 10th pass from an reputed and recognized institute. The pay scale of the VRO post is Rs.7740-23040. The selection for this post will be through written exam to be conducted by the Public Service Commission. The written exam will contain mostly the General knowledge questions. The written exam will be objective type. Only those candidates will be called in for the interview who will qualify the written examination.So, the selection will be totally based on the performance of the candidate in the written exam. * you have completed at least your 12 or, Intermediate. Apply for the post of V.R.O. Last date for submitting AP VRO VRA Online Application form willl 29-12-2011. Appointment Orders for VRO VRA Posts will be issued on 29-02-201. Be with us to know the AP VRO VRA Online Application Form filling Procedure and the website. for more detail visit on the below link. ACTUALLY , THE APPLICATIONS ARE CLOSED NOW. SO, YOU ARE UNABLE TO APPLY FOR THE EXAM. ---->> BECAUSE OF THE GATE EXAM , THE VRO EXAM IS POSTPONED TO 19-02-2012 THIS TIME. candidates can go through the e-sava with the valid photograph and fill up the details..
Halltickets will be available from [28-Jan-2012 11:00 AM] as per the new updates in the site . Selection process :Tashildar select candidate on basis of qualifying marks of exam. **The notifications regarding the post of VRO in Andhra Pradesh have already being published. candidate must complete the intermediate from the recognized college or university. The mode of selection of the candidates is based on the written examination conducted by PSC. The candidates will be mainly tested in the areas of General knowledge. The test will be generally an objective type test. The candidates who get qualified in the written examination will be called for the personal interview. through www.ccla.cgg.gov.in after submitting required application fee at any e-seva/mee-seva/ap online centre. When we are expecting the notification of JTO 2011? All times are GMT +5.5. The time now is 11:18 AM.